After his death, Alexander the Great’s empire broke into several parts, and Israel was under the control of the Seleucid Greek empire, based in Syria. Israel had lived peacefully under the Persian Empire and under the Ptolemic empire (of Egypt), both which tolerated Judaism but the Seleucid Emperor Antiochus Epiphanes was an arrogant, bigoted ruler who attempted to force the Jews to abandon their religion and to adopt the Seleucid Greek customs and worship,which included idolatry. There were those Jews back then whom considered themselves `modern’ and `assimilated’ who were willing to go along with this, even to the extent of having surgical operations to reverse circumcision. They even collaborated with the Selucid Greeks in subjecting their own people. Tyrants always overreach and the start of the Maccabee Revolt sprang from a single spontaneous act of resistance. In the foothills village of Modi’in in 167BCE, a Greek army unit set up an altar, and ordered the local Jewish rabbi, Mattathias, to sacrifice a pig and eat it. He refused, as did his five sons. When a Jewish collaborator came forward to offer to perform the sacrifice, a furious Mattathias “ran and killed him on the spot, killed the king’s officer who was forcing them to sacrifice, and tore down the altar” (1 Mac. 2:15-25). Mattathias, his sons and their followers then headed for the Judean hills, to launch a guerrilla war along with a handful of followers. They were farmers who had no military training, facing a war with a well armed professional military. There hadn’t been a Jewish army since Babylon had destroyed the Judean kingdom four centuries before. The only weapons they had were farming tools and whatever simple weapons they could construct, such as bows, maces and slings. During this first year, Mattathias died, and his middle son Judah took over command as his successor. 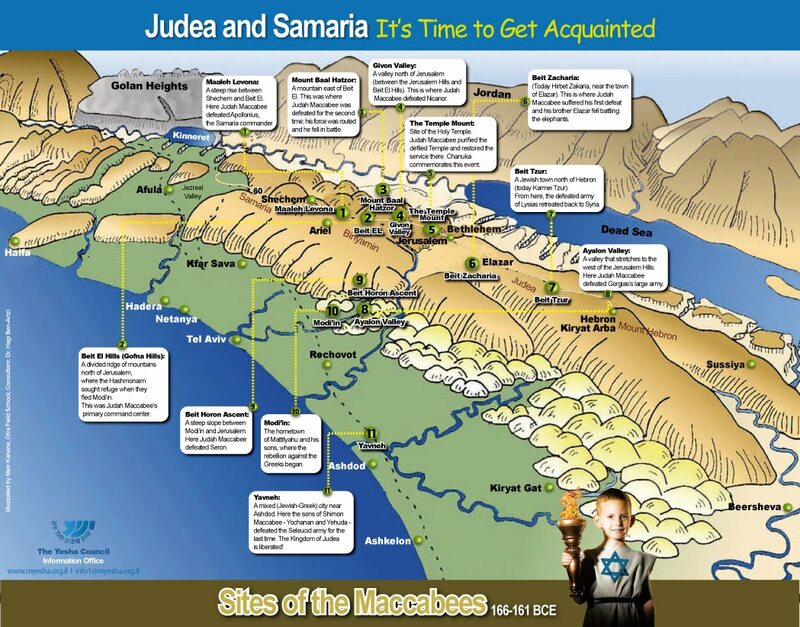 Nicknamed “the hammer” (“Maccabee,” in Hebrew), Judah put together a guerrilla army that staged daring nighttime raids on the Greek outposts, then melted back into the countryside. His successes attracted more supporters, and the revolt spread. The war went on for 25 years, one of the most singular wars for independence in history. It’s amazing that it was fought at all, let alone won. One thing that is seldom mentioned about the war is the fact that a significant part of it took place against the Hellenized, `modern’,`assimilated’ Jewish traitors I mentioned earlier, who were more than willing to abandon the Jewish way of life and supported their Seleucid masters against their fellow Jews. As Ecclesiastes famously said in the Megillot, there’s nothing new under the sun. So the Maccabees built a new altar. When the time came to light the N’er Tamid, the Eternal Light of the Temple, the Jews could find only one sanctified jar of oil marked with the seal of the High Priest. It was enough to last one evening. On the 25th of Kislev, in the year 164 BCE,the lamp was lit with this small jar of oil and, miraculously, stayed lit for eight days, until more oil suitable for the temple was made. The eight days of Hanukkah celebrate that miracle, as well as the divine intervention that had led the Jews to amazing victories over well-equipped enemies far superior in numbers. “Therefore, carrying ivy-wreathed wands and beautiful branches and also fronds of palm, they offered hymns of thanksgiving to Him who had given success to the purifying of His own holy place” (2 Mac. 10:7). The war itself continued. In 160 BCE, near modern-day Ramallah, Judah was killed, but Judah’s brother Jonathan, and then his brother Simon took command of the Jewish army, finally winning complete independence in 142 BCE. At last, “All the people sat under their own vines and fig trees, and there was none to make them afraid” (1 Mac. 14:12). That verse from the first Book Of Maccabee, by the way, was quoted by America’s first president George Washington in his famous letter to the Jewish community in Providence, Rhode Island in 1790, telling them they were welcome in America. Being obviously familiar with the story of the Maccabees,General Washington may well have taken comfort in the dark days of our own struggle for independence and freedom from tyranny from it. Hanukkah reminds us that with G-d’s help, victory over evil is assured, that light triumphs over darkness and no miracle is impossible. Modern Israel and the survival of the Jewish people against all odds are proof of that.